Chappaquiddick: How to spin a movie about spin? A new drama about the Ted Kennedy scandal seeks a mass audience in a politically polarized climate. Directed by John Curran, PG-13, 109 min. Is there a mass audience for Chappaquiddick? 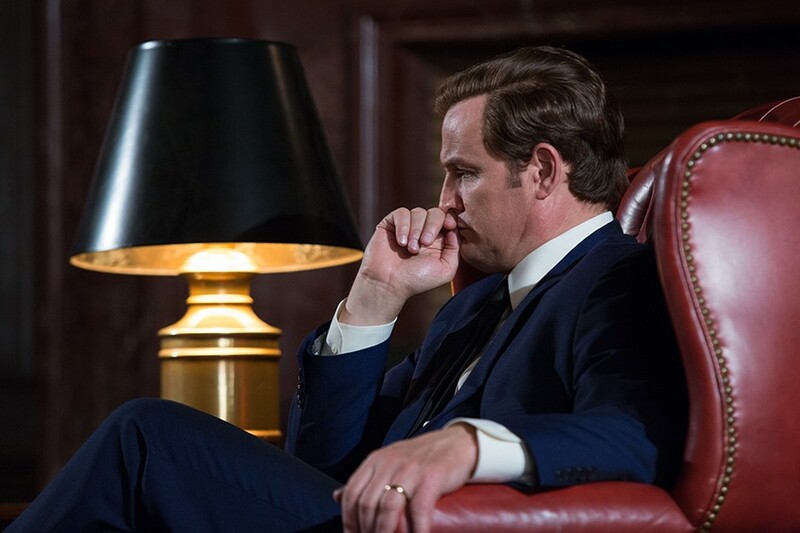 John Curran's new drama about the 1969 scandal involving Massachusetts senator Ted Kennedy opened April 6 on 1,560 screens across the U.S. but so far has grossed only $11.8 million and appears to be fading at the box office. Actor Jason Clarke, who plays Kennedy in the movie, has publicly lamented its shutout from such liberal TV programs as The Rachel Maddow Show and Real Time With Bill Maher. At the same time, Curran turned down an interview request from Sean Hannity of Fox News, telling Indiewire, "I'm not embracing the right. They're going to embrace this film anyway, see it through their own prism. I could have picked a film that's a lot easier to market." Here in Chicago the movie opened with a flood of TV spots but no press previews, a common strategy for such conservative fare as biblical or military dramas; I was surprised to learn that the filmmakers of Chappaquiddick were liberal. The difficulty of marketing Chappaquiddick seems ironic, given that the movie itself exposes a cynical public relations campaign. Screenwriters Taylor Allen and Andrew Logan, sticking to the known facts, re-create the night of Friday, July 18, 1969, when the married, 37-year-old senator, relaxing on Chappaquiddick Island near Martha's Vineyard, left a private party with 28-year-old Mary Jo Kopechne—a former campaign worker for his brother, Robert—and accidentally drove his car off a bridge into a tidal channel. For ten hours Kennedy failed to report the accident, during which time Kopechne suffocated inside the submerged vehicle. His actions before and after the crash have been scrutinized ever since; less known to the public, and amply revealed in Chappaquiddick, is the PR offensive he and his family's high-powered advisers mounted to salvage his reputation with the voters of Massachusetts. Countless books and articles have dissected that fateful weekend, accusing Kennedy of everything from adultery to murder, but Chappaquiddick has no trouble steering away from the crazy stuff because the facts are damning enough. That Friday, Ted flies into Martha's Vineyard to compete in a sailing regatta with family friend Joe Gargan (Ed Helms), then checks into a hotel and is ferried out to a rented cottage on Chappaquiddick to attend a party for six young women who helped run Robert Kennedy's 1968 presidential campaign. There's drinking and dancing. Around 11:15 PM, Teddy borrows his chauffeur's '67 Oldsmobile to drive Mary Jo (Kate Mara) back to her hotel. In sworn testimony, Kennedy said the accident occurred soon afterward, but Chappaquiddick sides with the deputy sheriff who made a partial ID of the car not far from the bridge around 12:45 AM. In the interim, Teddy and Mary Jo park together, drinking beers on the car hood while Ted whines about his demanding father. The filmmakers also register their skepticism of Kennedy's story that, after escaping from the overturned car, he dove down multiple times to determine whether Kopechne was still inside. Instead Curran shows the car hurtling over the edge, cuts to black, and rejoins Teddy as he cries and shivers on the bank; only later, when Teddy is crafting a statement for the police, does Curran present his rescue effort. After walking the mile and a half back to the cottage, Teddy drags Gargan and another friend, Paul Markham (Jim Gaffigan), a former U.S. attorney for Massachusetts, back to the bridge, where the two men make repeated, fruitless dives to the bottom and implore Teddy to report the accident to the police. He agrees, but the next morning Gargan and Markham find him at the hotel, showered and dressed, having breakfast with friends as if nothing has happened. When they confront Teddy in his hotel room, he nonsensically blames them for not summoning the authorities. "I was afraid," Kennedy wrote 40 years later in his memoir True Compass, published shortly before he died of cancer. "I was overwhelmed. I made terrible decisions. Even though I was dazed from my concussion, exhaustion, shock, and panic, I was rational enough to understand that the accident would be devastating to my family." His final account of the accident is humble and remorseful, but he has nothing to say about the days that followed, when Kennedy family wise men and fixers gathered around him to manage the fallout and preserve his brothers' political legacy. By Saturday afternoon, Teddy is back at the Kennedy compound in Hyannis Port, conferring with a ten-man war room that includes JFK's former speechwriter Ted Sorenson (Taylor Nichols) and secretary of defense, Robert McNamara (Clancy Brown). "Well, Bob, you handled the Cuban missile crisis," cracks Sorenson. "Let's see what you can do with this one." Their full-court damage control steadies the senator and provides him with a bulwark against Gargan, who thinks he should resign his office. (Helms, a comedy player best known for The Hangover, contributes the movie's best performance as Teddy's conscience-stricken pal.) McNamara argues that they must get control of Kopechne's body before an autopsy is performed, and arrangements are made for a death certificate that will allow them to transport the body over state lines to her parents in New Jersey. When Teddy confesses that his driver's license is expired, someone else contacts a local DA to fix the problem. Another man is dispatched to New Jersey to watch over the Kopechnes, who keep framed portraits of the Pope and JFK on their walls. Sorenson points out that, if they can keep the story under wraps until the national newspapers go to bed at 5 PM, the lunar landing scheduled for the next day might blunt the scandal's impact. By Sunday, Teddy is modeling a neck brace that he plans to wear to Mary Jo's funeral in hope that it can win him some sympathy from the public. The coincidence of the Apollo 11 moon walk provides the screenwriters with an ideal metaphor for Teddy's predicament. After all, President Kennedy was the one who had set out to land an American astronaut on the moon by the end of the decade; now his old Republican rival, Richard Nixon, was presiding over the great triumph. Robert Kennedy had expected to run as the Democratic nominee against Nixon before he was gunned down in June 1968, and as Teddy explains to Mary Jo in the movie, he was besieged by Kennedy loyalists begging him to take up his late brother's campaign. Surrounded by his children in front of the TV set on Sunday night, Teddy watches archival footage of JFK's famous 1962 speech in Houston, when he declared, "We choose to go to the moon in this decade and do the other things, not because they are easy, but because they are hard." Teddy Jr., sitting in his father's lap, asks, "Uncle Jack could do anything, huh, Dad?" Nixon may serve as an invisible foil for Ted Kennedy in Chappaquiddick, yet as biographer Adam Clymer has pointed out, the culmination of the senator's damage control was a nationally televised speech patterned after Nixon's famous "Checkers speech" in 1952. After appearing before a district court judge, who gave him a suspended sentence for leaving the scene of an accident, Kennedy appeared on all three TV networks to address the scandal. In the movie, Teddy asks Gargan to draft him a resignation speech, prompting his old friend to declare, "I'm proud of you." But by the hour of the broadcast, Teddy has decided to go with his advisers' carefully crafted speech; like Nixon, who was defending himself against charges of campaign corruption as he ran for vice president, Teddy ends with an emotional appeal to the voters offering to step down if asked. This strategy worked, and Kennedy held on to his senate seat until the day he died, though the very name "Chappaquiddick," like "Watergate," has become synonymous with the abuse of power.